Tarts are basically candles with no wicks. They're burned from below, usually via potpourri or special tart burners. Though they were created as a solution to the leftover wax candle makers had at the end of the day, they've become increasingly popular. Instructions for making soy candle tarts can be invaluable when you want to make your house smell good for as little as possible, and have fun doing it. Melt the wax in your manner of choice. Add the color to the mix before pouring it into the molds. Pour the wax into the containers. Let the filled containers cool and set. When the wax has cooled and the candles have set, you'll have to pop them out of the mold. Since there's no wick to hold onto and tug the candle out, you push the sides of the mold together and squeeze the candle out. Since tarts are so small, pushing the candles out of the molds won't take much effort to do. If for some reason you do run into problems removing the candle from the mold, you can put the candles in the freezer to loosen them up. Only do this for a few minutes, though, as soy wax tends to crack when exposed to extremely cold temperatures for any length of time. There are a few rules you should follow once you're ready to burn your creation. Make sure there are at least two inches between the flame and the bowl the candle's sitting in. Make sure that your melting bowl has at least a half-inch of wax in it, and that you use safe tart burners or potpourri burners. Never burn your tart in anything that wasn't originally intended for burning candles. That means no stoves, oil burners, etc. If you follow the instructions for making soy candle tarts, you'll be enjoying strong scents from clean-burning candles in no time. 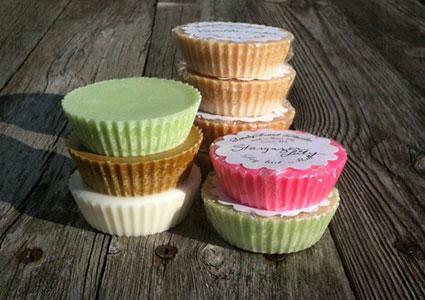 You just might just find yourself completely converting from paraffin candles to soy tarts.